THE BLUE LANTERN: Mary Hiester Reid: Can a Working Girl Ever Win? Mary Hiester Reid: Can a Working Girl Ever Win? What is it about accomplished women that makes them disappear like the Cheshire Cat, leaving behind their works to be sure, but barely a trace of a shadow? Consider the case of Mary Hiester Reid (1854–1921). She was born in Reading, Pennsylvania, the same place where novelist John Updike was born. Updike, whose interest in art was kindled by childhood drawing lessons, became an art critic for The New York Review of Books in the 1980s. The Pennsylvania Academy of Fine Arts, where Mary Hiester studied and where she met her future husband, the Canadian painter George Agnew Reid, also exerted a decisive influence on Updike's experience of art. Yet I can find no mention of Hiester Reid's work anywhere in Updike's writing. Although women were not not encouraged or even allowed to study art during the 19th century, and although they were denied access to the all-important anatomy classes, Mary Hiester, persevered. 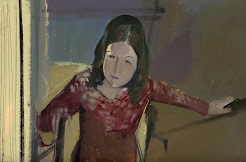 Not only did she graduate from the Academy but she became an accomplished painter in the then avant-garde Tonalist style, paintings characterized by the subtle use of color to create intimate moods, even in broad landscape vistas. Furthermore, after Hiester Reid moved to Canada with her husband, she was not confined to the world of home and children. One of the first women to have her work included in the collection of the National Gallery of Canada, her paintings were admired by critics and earned her a good. living during her lifetime. The Reids eventually made their home at Uplands Cottage in the Wychwood Park section of Toronto, an enclave similar to Roycroft in East Aurora, New York; they spent their summers in northern New York State at Onteora and traveled frequently around Europe. 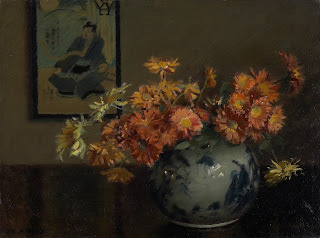 Hiester's painting of her Wychwood studio contains the flowers and light-capturing objects that so impressed viewers in her work. There is no way to denigrate her mastery of such subjects as 'women's work.' After all, no one apologizes for such flower painters as Pierre-Joseph Redoute and Henri Fantin-Latour. The year after Hiester Reid died, a retrospective of more than three hundred paintings was mounted at the Art Gallery of Ontario in her adopted home of Toronto. 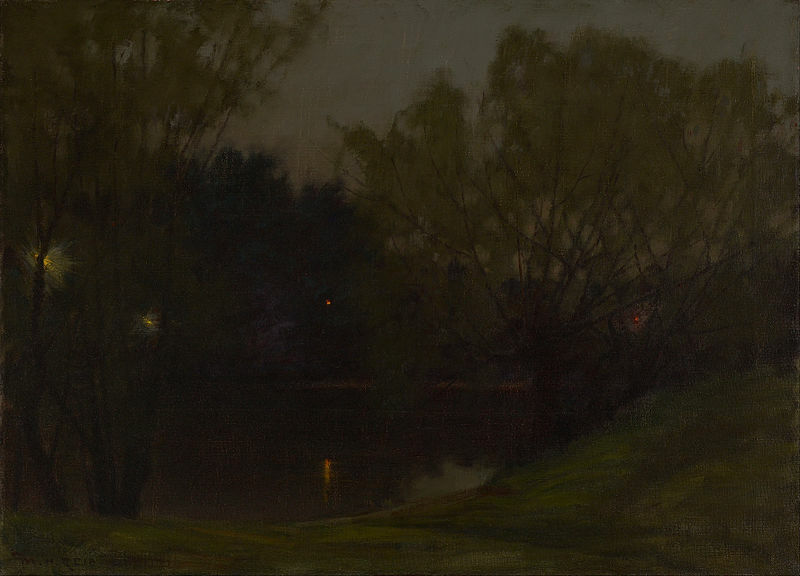 Recent decades have seen such renewed interest in Tonalism that its origin has even become a subject of debate. Do the French get to claim it for the Barbizon school or the Americans lay claim through James McNeill Whistler? May someone soon lay claim to Mary Hiester Reed> she deserves the accolades. 1. 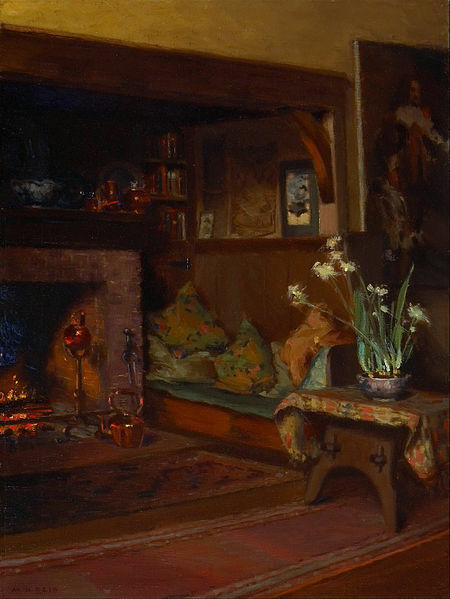 Mary Hioester Reid - The Inglenook in My Studio, c.1905-15, Art Gallery of Ontario, Toronto. 2. 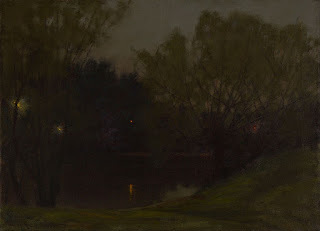 Mary Hiester Reid - At Twilight - Wychwood Park, c.199, Art Gallery of Ontario, Toronto. 3. 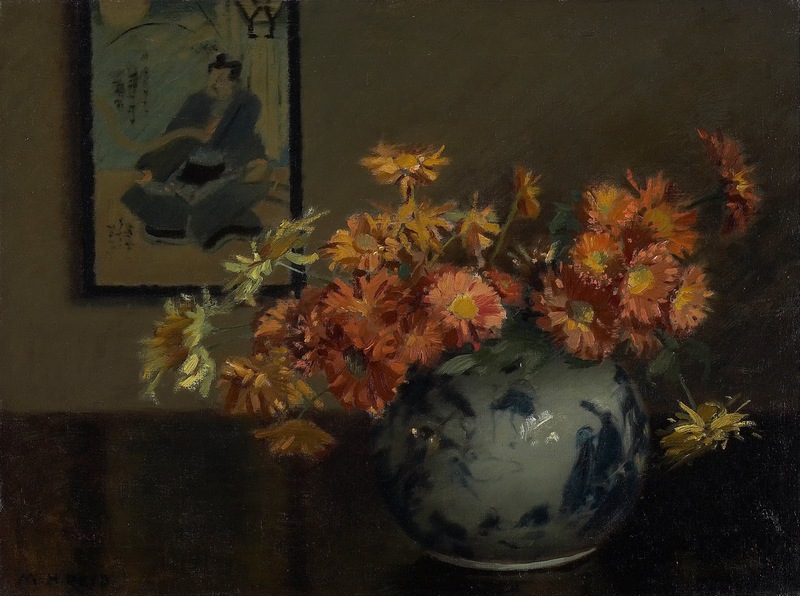 Mary Hiester Reid - Chrysanthemums - A Japanese Arrangement, 1895, Art Gallery of Ontario, Toronto.